Numerous events such as conferences, etc., are held in various countries throughout the year; however our list will concentrate on national and regional events in the U.S. that are important to our Inland Northwest Ostomy Community. Additional national and regional events may be announced on the website for the United Ostomy Associations of America (www.ostomy.org). August 6-10, 2019 Philadelphia is home to the 7th UOAA National Conference. It's a not to be missed event for the ostomy community and your chance to connect and learn from medical experts and people living with an ostomy from all around the country. Gather at Philadelphia 201 Hotel, a great vacation destination right in the heart of this historic city (Special UOAA rate available). Please join us and prepare to make new life-long friends, to laugh, shed a tear, celebrate and learn. You've earned it. The active Lifestyle Panel Discussion with ostomates of all ages will feature a race car driver, runner, and active grandmother and young professionals. Since 2010 in the United States, the first Saturday of October is National Ostomy Awareness Day. UOAA continues to celebrate this day by spreasing awareness and increasing national visibility of those living with ostomies. Ostomy Awareness Day in 2019 will be on October 5th. 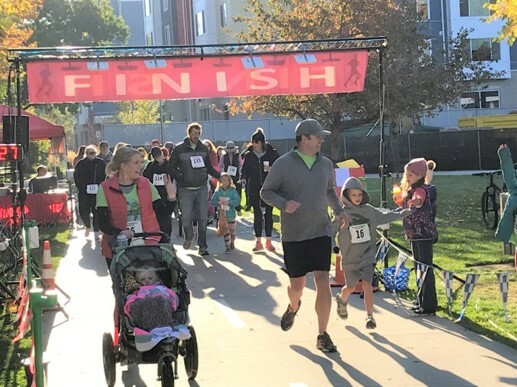 Among many other activities to be held in conjunction with Ostomy Awareness Day, Run for Resilience Ostomy 5k events will be held in several cities around the United States on October 5 and 9, 2019. Matt Herrett runs with his son Winnie (age 7) as he greets his sister Maggie (10) in the Boise, ID Run for Resilience, October 13, 2018. Both Maggie and Winnie are ostomates. Contact INW Ostomy Support at sosg.input@gmail.com with questions and/or suggestions.